When I finally purchased a pair at a reduced price, they flabbergasted me with their quality. 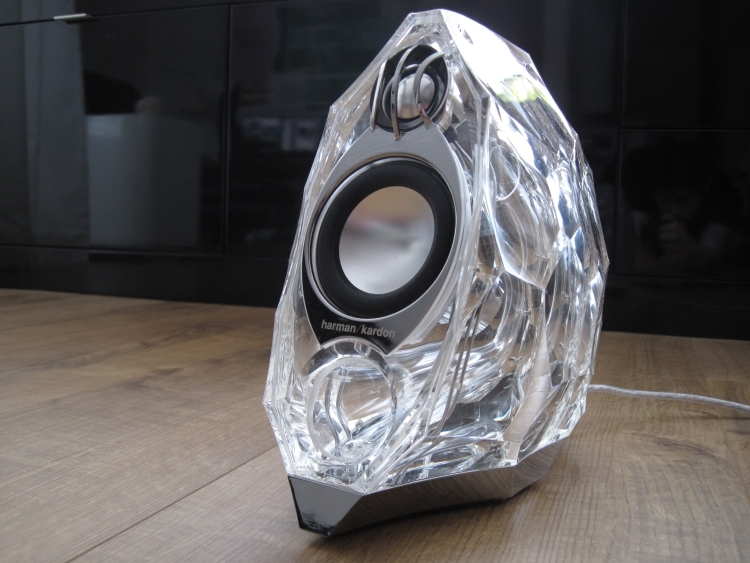 Harman Kardon have placed these speakers firmly in the highend camp. They even encourage us to not only use them for the computer but everywhere that we see fit. Seeing as the connecting cable is not that long at all, you’re going to be bound to a source that is less than 1,5 meters apart from the right hand speaker. Of course you can replace the cable with a longer one, but you’ll probably have to go for default black instead of the nice transparent one supplied. I’ll spare you any more background info as that can be read elsewhere. All I want to mention is that these are powerful powered speakers with integral volume control and DSP to correct the bass. And that really works well! From the moment that I connected them up, there was a sense of huge power and precision. The speakers can go incredibly loud without distorting. I turned up all sliders to the max on the PC and still they sounded utterly clear. But the bass is something to behold. Really. I read the marketing blurb, saying that you don’t really need a sub (although there is a subwoofer output at the back, which, incidentally is not filtered in any way and even stereo, not summed mono, so practically useless) but let me state this very clearly: unless you’re a die-hard head banger, you won’t need a sub. And I’m saying that with the bass level control set in the middle position. Turn it clockwise and you’re in for a surprise! So we have high power, low distortion and deep bass. What’s more? Well, the first minutes, hours, perhaps days, they’ll be slightly too bright and a little forward. I only have them 2 days now so cannot confirm with certainty. 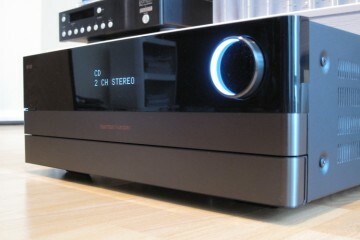 But even with them being slightly bright and forward, the sound is immensely enjoying. I used the soundcard output that was most relaxed which is the inbuilt Realtek onboard soundcard. On my other systems, the card is way too laidback and lacking power but combined with these speakers, it is a perfect match. Imaging is spot on. They have a tightly focused soundstage and absolutely do not sound small at all. The bass is not only deep but also articulate and fast, yet not dry or sterile. I was kind of fearing a clinical sound, due to the amp being of the digital kind. I guess that my smooth-sounding soundcard output has something to do with this too but either way, in this combination they are very musical and enjoyable. By now you probably know that I am very pleased with these speakers but there are some things to keep in mind. Apart from the slightly bright and forward nature of these speakers (that may well ameliorate in time) you need to keep in mind that they are very much full-range speakers. The bass goes really, really low. HK quote 35hz, but that is at -10dB so that’s cheating it a bit. Still, I hear low bass notes that don’t come out of the Magnepans when they are used without subs. 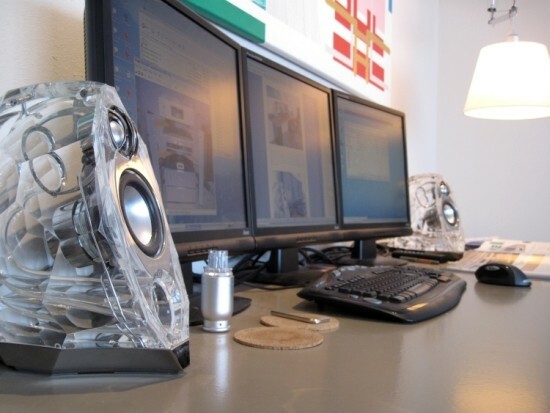 Normally, computer speakers either have only very little bass or they are sattelite-subwoofer systems in which the sub produces bass up to about 100hz, or higher. And in these circumstances you’re pretty much free to place the speakers anywhere you like and they will still sound fine. Not so here. As with any full range speaker, putting it atop a table and shoving it against the real wall isn’t going to produce the best sound they are capable of. I noticed this once I had set them up just like I had done my previous Apple Pro speakers. The result was huge bass but also huge coloration. On many tracks though this was perfectly fine and sometimes it even enhanced the enjoyment. With other tracks I felt that the sound boomed too much, the upper midbass being too coloured. Sure enough, lifting them up in the air by holding one speaker in my hand, produced perfectly accurate and highly uncoloured sound! This shouldn’t be underestimated. I’m guessing that when you go listen to these speakers, they will most likely be set up freestanding. That way they truly are the best computer speakers that I’ve heard thus far. But set them up incorrectly and they will sound not much better than a good Creative sub-sat system. Well, that’s not entirely true, as the GLA-55 will still beat them for coherence, transparency and detail but if you want your money’s worth (and in the case of the GLA-55 that is quite a lot: 999 usd) you’d better set them up at least 20cm free from the rear wall. That way they will produce clean, articulate sound with astonishingly deep bass. 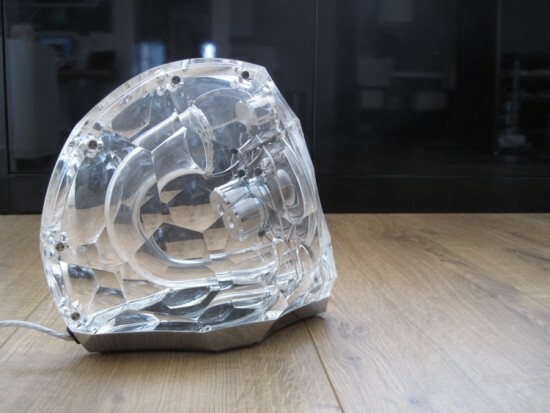 For real: I’m selling my Apple Pro (Jellyfish) sub. There’s no mistaking my enthusiasm but there are a couple of nags. First, the speakers are powered. And when they are powered on, you’ll want to know about it. That’s why they included little leds in both speakers that nicely light up the speaker from the bottom up. I have no problem with that. But after 10 minutes of silence, they switch to standby and this is indicated by the same leds flashing and this flashing is very annoying if you’re listening to music, watching a movie or do anything in the same room. It is not a smooth “heartbeat”, Apple kind of flashing but hard on – hard off flashing, very similar to those other Harman products: Mark Levinson. But at least, in the latter case, they are dim red leds, not bright white, room lighting ones. In addition, you can hear the powersupply beep at a different frequency when the lights are on. Beeping is quite normal for any cheap switched powersupply but that it alternates the frequency is pretty annoying. Now, you won’t hear this when listening to music or when you do anything that produces only the slightest noise. But when you’re reading a book in silence, you will hear this, unless perhaps when you tucked away the power supply behind a cupboard and under a pile of cables. As you might have guessed, you cannot switch these speakers off. All you can do is mute them, by pressing both volume buttons at the same time. This will also turn of the leds. Second nag: there is a little amp hiss. Not a whole lot and probably not more than any other computer speaker would produce but I was kind of expecting better from these speakers. But muting solves this too. Third nag: the supplied audio cable is very short. 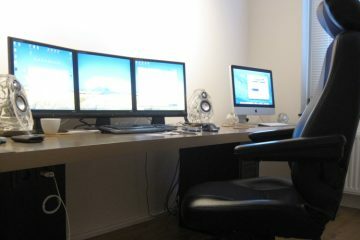 It will only suffice as long as the source is placed no more than 1,5 meters away from the right hand speaker. You can replace the cable by an ordinairy longer one but you will lose out on appearance. Fourth nag: the subwoofer output. It sure is a nice addition (although probably in most cases not needed) but why not filter the output to below 100hz or at the very least sum the signal into a mono output? The way that it has now been carried out is pretty useless for subwoofer use, unless the sub of choice has a stereo input and a well-designed filter. That’s all that I can find to moan about so you see: I’m still enthusiastic about these speakers, despite their little nags because after all, it is the sound that counts. And, as long as you set them up correctly, they will astonisch you with their quality.